The Furniss Corporation manufactures the custom designed Softgoods for the Phoenix Series Knee CPMs and the DC2480 Knee CPM. We have put the same considerations for quality, fit and function in our softgoods as we have in the design of our Continuous Passive Motion therapy equipment. We believe that the quality of the softgood is as important as the CPM in delivering patient comfort. We use high quality, deep pile Winning Grey sheepskin and high-tensil strength Velcro brand strapping in our manufacturing. Our Softgoods are designed to maximize the troughing of the leg that is unique to our open carriage CPM design. This allows for more flexibility in positioning of the patient which increases comfort and the overall quality of the knee therapy. 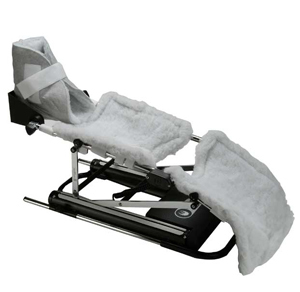 Furniss Corp ships a free set of softgoods with every Phoenix and DC Model knee CPM. Maintain the quality and re-order the Softgoods made by the company building the CPM. Furniss Corp CPM Softgoods are an excellent choice for many competitor CPM devices. The design provides exceptional patient comfort for superior quality and affordability to the healthcare provider. Contact us today to receive a complimentary softgood sample. For additional information and cost effective pricing, contact Client Services or call toll free at 800-273-5233.